You can view images of the available objects online, inspect them in person (map) on October 23rd, from 9AM-4PM (UPDATED TIME), and bid online starting now. The auction lots will close starting at 1PM on October 24th, so have your final bid in by then. Golden residents have enjoyed many good meals and happy occasions at the Briarwood, and it’s sad to see it go. This auction is your chance to buy a keepsake. You may be wondering what will happen next on that property. Confluence, which is the company that developed the 8th Street Apartments (across the street from the Briarwood) and is building the new sophomore apartment building across from Safeway plans to redevelop the Briarwood property. They visited GURA in May to discuss their early concept of apartments and a boutique hotel. GURA discussed the possibility of providing a tax incentive if they included low-income housing in the mix. The Planning Department expected to receive an updated plan from Confluence this month, which may be discussed at a Planning Commission meeting in November. The Briarwood has an imaginative event coming up on June 16th: A Willy Wonka & the Chocolate Factory Tea. Enjoy extra special sweets, loose leaf teas, warm scones, tartlets & finger sandwiches, finished with refreshing sorbet. Reservations are available from 10AM-2PM. The cost is $42 per person, or include bottomless sparkling wine for $55 per person. Call 303-279-3121 for reservations. Another Briarwood event to get on your calendar: they’re having a Pink Patio Party on Wednesday June 20th at 6PM. Tasate over 15 rose wines from around the world with light bites. The cost is $65 per person for the wine tasting and food pairings. Reservations are required. The Briarwood is open for dinner every Friday through Sunday from 4:30-9PM. Join them for Happy Hour, featuring half price food items, every Friday from 4:30-7PM. 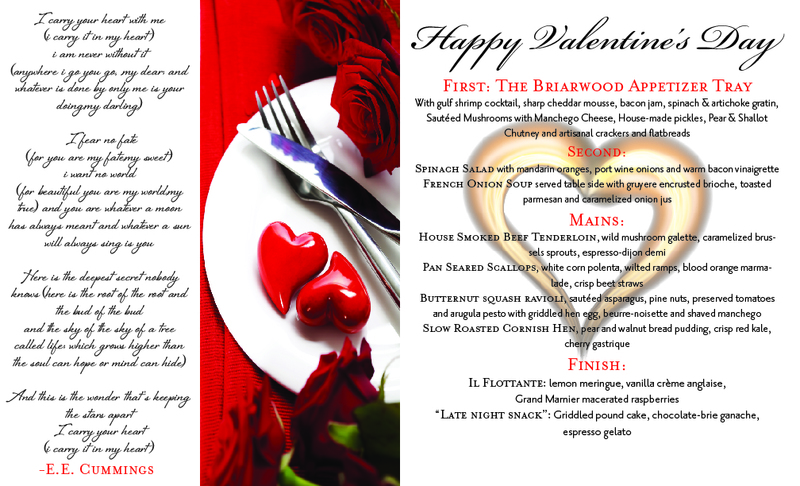 The Briarwood is open for dinner again! They’ll be open for dinner on Friday, Saturday and Sunday nights from 4:30-9PM. Learn more and see the dinner menu…. This is the final day of operation for the Golden Mill. They are having an Inventory Reduction Sale, so stop by, see if they have anything you need, and say your farewells. Richard Gardner wrote an interesting history of the Golden Mill. You’ll find it in our News Stories About Golden section. Celebrate Easter while enjoying our indulgent brunch buffet, live music and family photos. Children can participate in Easter egg hunts at 1 p.m. and 2 p.m., visit the Easter Bunny and enjoy the balloon artist! Celebrate Easter Sunday Brunch with Indulge Bistro & Wine Bar! Our brunch buffet offers a mouthwatering array of chef-crafted dishes and decadent desserts. Denver Restaurant Week runs from February 23rd to March 4th. During this event, top-tier restaurants design specially-priced menus designed to entice new patrons. Four Golden restaurants are participating. Their menus are listed below, courtesy of Denver.org. Dessert: Raspberry Mouse boba cake. We also offer discount prices on Large hot sake, large Kirin for $6.00; Sapporo or IPA Rebel for $4.00; Coors or Coors Light for $3.00 when ordering with Denver Restaurant Week Special.